It's a series of unfortunate money-draining events! For the average shopper, a bazaar is a place for great finds and fabulous bargains. Little do they know that there are monstrosities that lurk beneath the façade of dainty stalls and the brightest of spotlights – incidents and creatures that paint dread behind the smiles of seemingly cheerful vendors. We managed to unearth five terrifying tales. 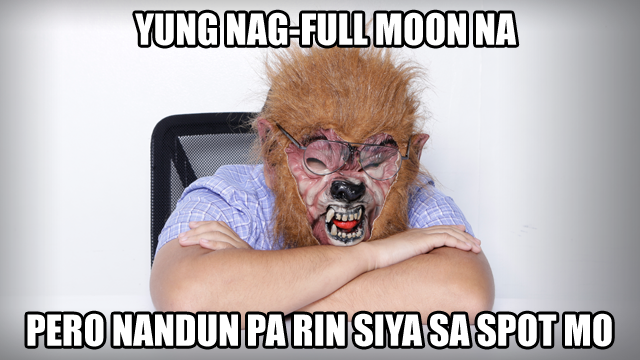 For your own sake, we advise you to proceed with caution. The bargain boogeyman appears like a regular would-be customer who shows particular interest in your products. It will heap lavish praises upon your goods, exhibiting signs of being a sure buyer. 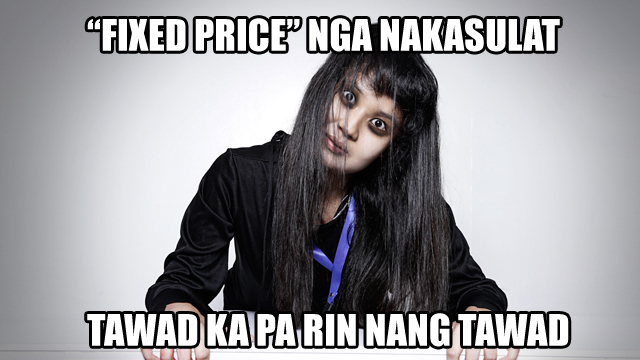 Once the creature is in your good graces, it will blindside you by asking for a bargain. You've used up all your saliva explaining that you’re trying to break even or you’re working with a meager mark-up, yet it still won’t let up. When it begins holding up the line of customers, you will be forced to either give in to its demands or withstand a series of abrasive comments as you watch it slowly walk away. 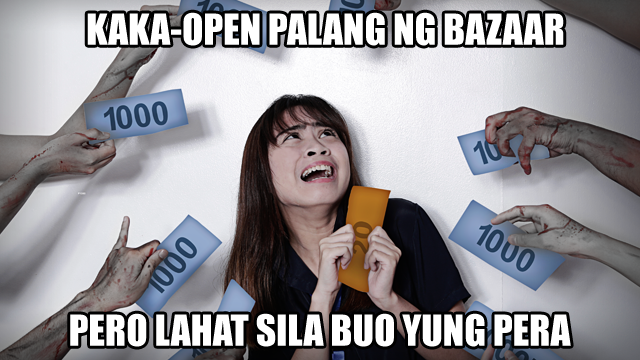 Just when you thought you've bagged the perfect spot at the bazaar, you will arrive to find an unpleasant surprise. Your selling space has been occupied by the booth space thief, with its equipment and displayed products already set. If you attempt to reason with it, it will simply brush off your assertion by stating that it didn’t know the venue's layout and claim that its staff will have a hard time moving the equipment. You've got a great booth set up, and your products are some of the best out there. So why aren't bazaar-goers flocking to your stall in droves? 'Maybe they just don't belong in your target market,' you think. So you end up joining a different bazaar somewhere else. Then another, and another, until you end up criss-crossing Valenzuela to Alabang in search for the holy grail of bazaars. 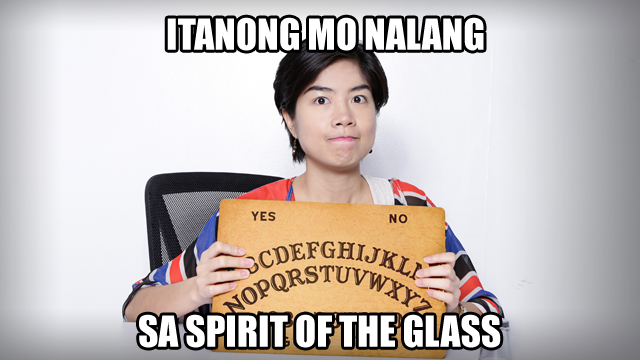 In your desperation, you've dusted off the Ouija board in your attic, hoping some kind spirit can provide you with some insight. 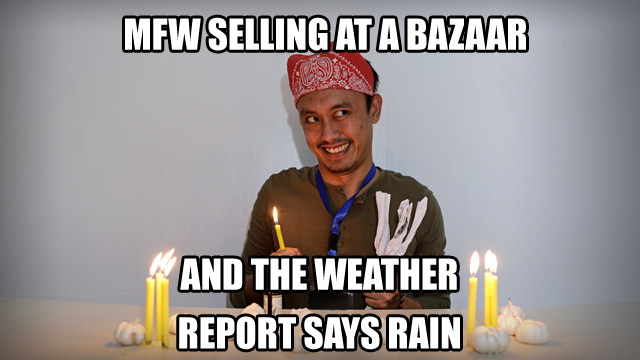 Perhaps the scariest bazaar horror story of all, the droplets of doom cause astronomic losses for most of the vendors. After shelling out significant sums for your wares, the heavens open up and rain pours down. Bazaar-goers are, then, forced to just stay home or find shelter within the confines of shopping malls, thus turning the tiangge into a ghost town. Your spirit sinks, but not nearly as deep as your sales do. Experienced vendors all know the terror of coming to a bazaar without stacks of small bills and coins on hand, especially during opening time. Relentless hordes of people come at you with money in denominations far larger than your mind—or change drawer—can handle. And when your mouth betrays the age-old cliché, “Do you have smaller bills?” and your customers shake their heads no, prepare to run, run, run through the bazaar in search of a helpful soul who can help break your money. Halloween's the only acceptable time to deal with scary beings, and no seller deserves to be terrorized by the ones above all year round. 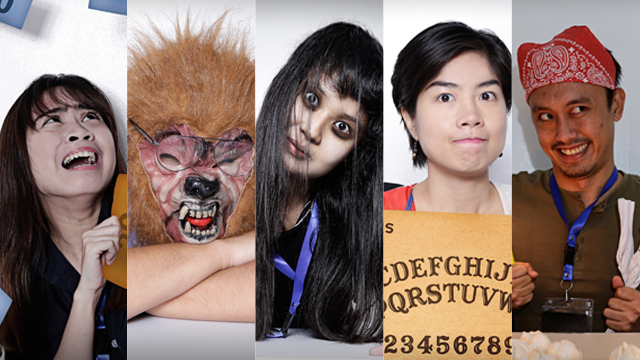 Experience all the perks of selling in a bazaar without encountering these ghoulish beings by signing up with Digimall! It's Globe myBusiness' biggest online bazaar, letting you sell to millions without even leaving the comfort of your headquarters. Sign-up to Digimall now!